One of the best arguments for deploying Objectives and Key Results (OKRs) is the emphasis on a shorter cycle. More frequent review cycles lead to more rapid learning, more opportunities to make progress and get a feeling of winning at work, and more places along the road to adjust course, shifting focus to what’s most important. However, the emphasis on a short cycle is often cited as a potential pitfall of OKRs. Are OKRs too shortsighted? How can OKRs be strategic if they look out only for a quarter? And at Intel, OKRs were set each month, which pundits might say make OKRs look tactical rather than strategic. Given that Objectives often change each cycle and Key Results usually change, what stays constant? We see imagery for OKRs that feature an arrow hitting a target. But moving targets are hard to hit! So, with OKRs, where is the longer-term description of an organization’s strategy? The target that stays in place? Some organizations set annual OKRs in addition to quarterly OKRs. But often they set annual OKRs at the company-level only. The power of Key Results depends on the shorter timeframe to get us focused on near term results. So, some organizations that set annual OKRs actually only set an annual Objective and leave the Key Results out. M + OKRs = MOKRs. In fact, I first learned about OKRs as “MOKRs” in a presentation entitled Never before Disclosed Oracle Planning Techniques. Having a clear mission, and aligning OKRs – whether monthly, quarterly, or yearly – to that mission, helps ensure that work performed in the short term, is meeting the long term strategic mission of the organization. Let’s look at an example MOKRs and see how it enables OKRs to be defined within a longer-term context. “Present the first comprehensive competitive analysis featuring new players in the mobile market”. Note that each of these Objectives supports the longer-term Mission. 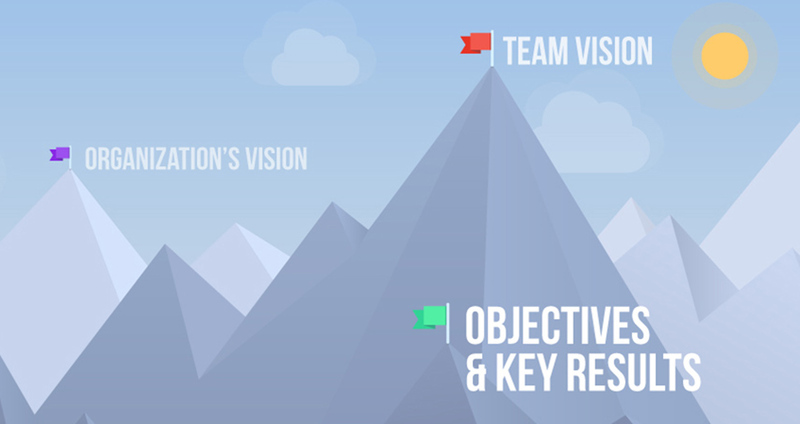 When I first deployed MOKRs in a mid-sized software company with 5 business units and roughly 50 team leaders, the 10 minutes I spent with each manager to define their team’s mission was probably the best time spent in the entire project. The new CFO could now quickly read through a list detailing how each team believes they fit into the big picture. And the list was developed bottoms-up. That is, each team leader proposed their own mission. By making all the missions public, it was quite easy to see how the missions connected and were aligned throughout the organization. By actively involving teams in the mission setting process, organizations can dramatically increase employee engagement. This is key because in order for an OKRs implementation to be effective in driving better results, employee engagement and buy-in must be high. For more information on how OKRs (and MOKRs) can be used to drive better results and create engagement, look for my upcoming interview with the Engagement Game. In closing, I’d like to share the following MOKRs exercise that I highly recommend completing BEFORE developing OKRs. Exercise: At your next team meeting, ask every team member to write down in one sentence what they feel best describes the team’s mission. Then read each statement aloud. You might learn a lot. Plus, this 5-10 minute exercise will get everyone thinking about why they work and how they contribute to the larger picture. A great start to any OKRs or (MOKRs!) implementation!